SoundLAB 2018: Applications are now OPEN! 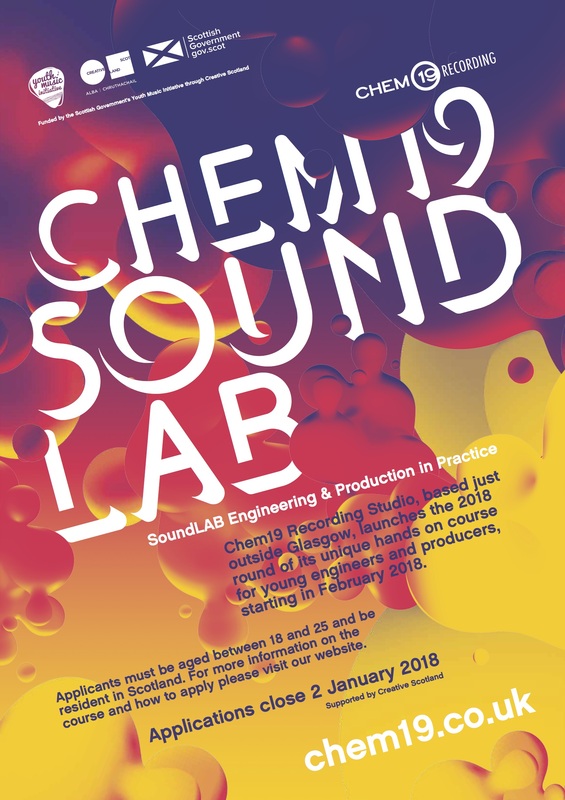 Chem19 is proud to announce the 7th run of our unique audio engineering & production course SoundLAB, made possible by the Youth Music Initiative Fund (Creative Scotland). The course this time round takes place every week, sessions lasting 4 hours and taking place at our studios in Blantyre. Designed to take the budding engineer/producer from basic knowledge to being equipped to run a day’s working recording session, the course combines practical hands-on workshops with internet based tutorials & assignments over the 5 month period of Feb – Jun 2018. To be eligible, applicants must be between the ages of 18 & 25, be resident in Scotland and have some basic experience in audio recording. No previous qualifications are necessary. To apply, please download the SoundLAB | Engineering & Production Course Leaflet 2018 which outlines the course and its application details.